Jenny Chard and Sean Tomato pick their way through soggy McIntosh trees looking for dropped apples. The selection is slim. Most of the good fruit left at Shelburne Orchards has been scavenged. But they keep looking, trying to fill their wooden box with apples they can puree into sauce for local food shelves. “You think it’s OK if they have bites out of them?” Sean asks his harvesting partner. “I don’t know. But I’m not finding any good apples,” Jenny says. “Maybe they’re all over on this side,” says Sean, gesturing toward the trees across the row. Dingalingaling! A cowbell chimes, and Sean and Jenny part ways. Sean goes with Rachael Radish. Jenny goes with Mike Bok Choy. In Weed Dating, time is short — five to seven minutes per interaction. Then it’s on to someone else. In the world of singles activities, Weed Dating may just be the least awkward and angst ridden. You don’t have to maintain eye contact, you can focus on a task — in this case, picking drops — and the work gives you something to talk about besides your job and where you’re from. On this wet Saturday, singles who came to the Weed Dating finale could chat about the best methods of making applesauce or their love of cider doughnuts. Despite its cheeky name, Weed Dating has nothing to do with marijuana. It’s an experiment of sorts, hosted by the Northeast Organic Farming Association of Vermont, to help agriculturally inclined types meet the like minded. It’s speed dating for farmers, gardeners and others who don’t mind getting dirty. Credit Tunbridge farmer Wendy Palthey with the idea. Palthey, who runs Tunbridge Hill Farm with her husband, says the idea came to her when she was talking with some NOFA people about how hard it is for farmhands to find friends and dates. Wouldn’t it be great if there was a special kind of speed dating for farm folks? The NOFA staffers didn’t think they had the capacity to plan and run such an event, but plucky intern Sarah Heusner took off with the idea. She created the rules and worked to get the word out about what eventually became a series of four Weed Dating afternoons. The first event was held at Palthey’s farm, the next three on other agricultural lands. With the exception of the finale, Weed Dating works like this: Participants choose a pseudonym that reflects their favorite fruit or vegetable — Natalie Mango, Sarah Watermelon, Adam Peaches & Nectarines. (As with any speed-dating event, there has to be some measure of anonymity for safety.) Then they receive a number and are told to pair up with the next number in sequence. One goes with two, three goes with four, etc. 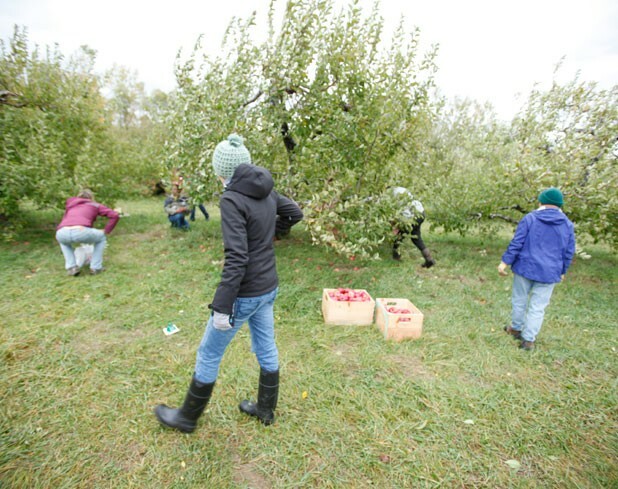 Because the last event happened in the fall, NOFA wanted to hold it at an apple orchard. But picking up fallen apples is every bit as mindless as weeding, so the concept carries over. When Heusner rings the cowbell after about seven minutes, it’s time to switch partners. Odd numbers stay in their rows, while even numbers rotate. This continues until all the evens have met all the odds. Then they are mixed up again, so everyone gets a chance to meet everyone else. Pairs aren’t made by gender: “We didn’t want to make assumptions,” says Gildrien. If all the pairs were male-female, plenty of participants would be left out. At the Shelburne Orchards Weed Dating event, just four of the 12 participants are male. That’s a much better turnout than at the previous events held at Montpelier’s Food Works at Two Rivers Center and Shrewsbury’s Alchemy Gardens, where total participants numbered fewer than 10. Gildrien figures the numbers are pretty good, considering that summer is peak growing season, when farmers work exhaustingly long days. Plus, many people who might be interested in a dating event like this live in rural areas far from the population hubs where the activities were held. Gildrien doesn’t believe the low turnout means people don’t need Weed Dating. Farming and rural living can be isolating, she argues. Agricultural work is physically demanding and doesn’t pair well with late nights spent cruising the bars for potential mates. And not everyone feels comfortable trawling clubs for a date. That’s the case for Meg Arugula, who lives in Burlington and works at City Market. She came to the Weed Dating finale because, ideally, she’d like to meet a guy who enjoys working outside. At least at an event like this, there’s more of a chance people will share your interests, she reasons. “In Burlington, all the bars feel like college bars. But dating is tough anyways,” Meg says. Rachael Radish, from Westford, used the event as a way to meet new people, not necessarily to make a love connection. She recently moved back to Vermont from the Pacific Northwest and will be working at Gardener’s Supply for the holiday season. Despite the rain and the lopsided ratio of males to females, Rachael says she enjoyed herself and met a few folks she could see herself hanging out with, though not romantically. The low attendance of Weed Dating hasn’t stopped it from drawing the attention of media outlets both in and outside Vermont, ranging from agricultural blogs to national radio programs. At the finale, four journalists hovered over participants as they picked drops and made small talk. One of them — a news photographer from WCAX — carried a huge television camera, spooking more than a couple of Weed Daters, who asked that their real names not be used in this story. The media engaged in this lovefest have framed Weed Dating as something of a quaint Vermont curiosity. But Gildrien says there’s more to it than that. Living in a rural state is hard and leaves people desperate for human connections, she says. Online dating can be off-putting and overwhelming for many, and meeting other people with compatible interests and values can seem nearly impossible. While Weed Dating may not have spawned any matches “made in Nofavore heaven” — as the promotional material says — all the participants leave knowing they’ve made new acquaintances while collecting apples that will eventually feed hungry Vermonters. And, as orchard owner Nick Cowles reminds the group, you never can tell how things will turn out.